You can now Donate directly from your phone! Text "Child" to 56512 to learn more! Please help with your Donation Today! Help Us Create Clean Water for Children! History in Kenya! Over 175 Schools supplied with Clean Water Systems by CHRF and Partners! TEN children die EVERY MINUTE from malnutrition. Find out how CHRF is helping around the world. Angels in the War Zones! We go when and where we're needed, places other groups refuse to enter. 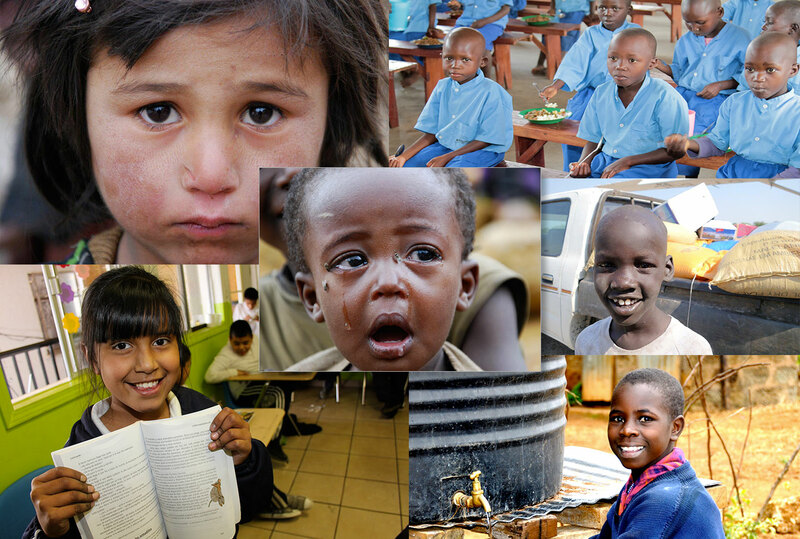 121 million children are not able to go to school. Discover how easy it is to help a child survive and prosper. More than 1 billion people do not have clean water. Waterborn illness kills over 4,500 people every day! Read about our Lifesaving Child Immunization Programs and learn how easy it is to help save a child! Making a difference One Child at a Time. This is the vision and beginning of CHRF. Helping families help themselves is the only way to change the lives of these children born into poverty. An inspirational resource and tool for life transformation authored by CHRF Board Members. “Every day, every year, CHRF makes a difference in very concrete ways in the lives of children, the elderly, the sick, the weak, and the disadvantaged around the globe. Whether supplying micro-enterprise loans to aspiring young entrepreneurs in Third World countries, food and blankets to misplaced citizens suffering natural disasters, water wells in Africa to mothers and children who live daily on the brink of survival, or basic medicines to orphanages in Latin America, CHRF is simply one of the stellar charities in the world." "The ministry of CHRF is managed by hard working people of great integrity who give constant attention to how every dollar is spent. As a Christian charity, it recognizes there are only some things God can do and that the transforming of people's lives ultimately begins with being restored as persons by the strength and power of God." "We support CHRF in our mutual endeavor to bring hope, relief, resource, and God’s love to marginalized women and children around the globe. It’s great to align with partners who we know are making a difference wherever they go!" "I wanted to find a charity I could trust. Once I got to know the staff at CHRF, I realized this group was established by good people. I always want my giving to make a large impact. For over a decade 95% of CHRF’s donations are allocated to projects. I feel good about my donations to CHRF." Every 6 seconds a child under the age 5 dies from starvation, lack of drinking water, or lack of vaccinations. That's almost 6 million avoidable child deaths each year! We need your help to save more children. We're now serving millions of meals a year in over 20 countries. Our educational and vocational training programs help break the cycle of poverty. Just 30 cents a day can help keep her alive. Yes, that little helps to save a life for just $9 a month. Hard to believe that 30 cents can mean the difference between life and death! There are many ways you can support CHRF! Getting involved and making a difference is easier than you think.